This is my second image about Carnival costumes. As I said most of them are regional clothes mainly from the immigrants, the new Catalans that added the brightest colors to Carnival celebrations in the city of Barcelona. 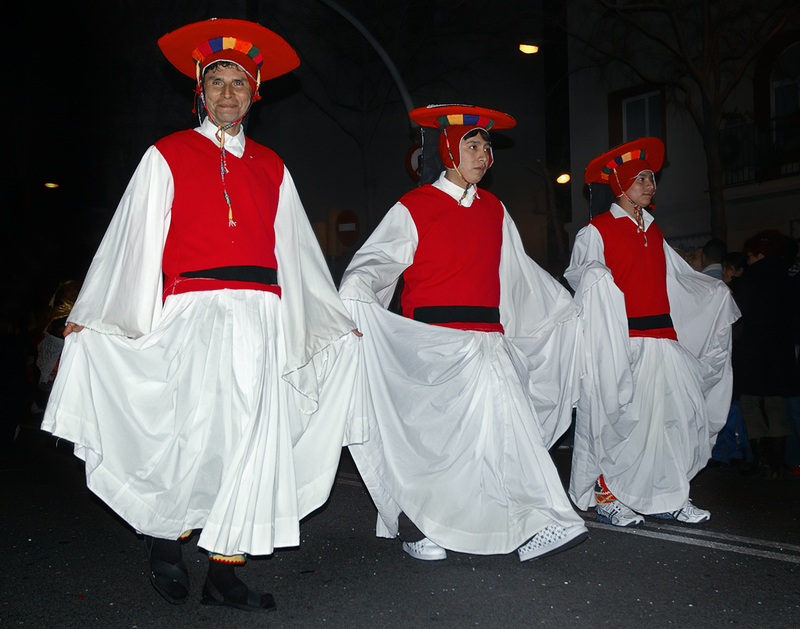 This year a new variant has been introduced in the event: the Rua, that is, all the participants in the parade (about 3000 people) walked along Passeig Maragall, a long avenue in the Nou Barris and Horta Quarters about 20 minutes from the city center (subway or bus). As you can imagine to have such an important event happening in front of your door once in a life time makes all the citizens in this part of town quite happy. No more traffic jams going downtown to find that there's no room to watch the parade and then walk your way back because the subway is packed with people or buses won't stop. It was about time authorities organized Carnivals in other areas of Barcelona. I don't know who the smart guy or girl was, but hey, you can have yourself a couple of drinks, I pay! Beautiful photo. Where do the immigrants come from? -You mean all of them or these immigrants? We have people from all over the planet. These men in particular I suppose are from Ecuador but don't take my word on that. Many Latin American come to live in Barcelona for obvious language reasons. Countries like Ecuador, Bolivia, Peru, Argentina and Uruguay have big communities in the city. Although India, Pakistan, China or citizens from "the old communist block" are well represented. Thank you Carlos. I did mean "all" of them. It is very interesting - sort of like migration in reverse from Latin America. Of course, Barcelona is so beautiful, who wouldn't want to live there?